"I'm proud to be publicising a project that looks at the long term needs of its customers and the environment." It’s important for us to build on the success and popularity of the venues to date and to take that into the next 20 years. User demand has changed considerably over the last 25 years. This project will see Perth Leisure Pool substantially redeveloped and re-modelled with considerable flexibility built in, ensuring that it reflects shifting trends and customer aspirations. The provision currently is fragmented with activities being delivered across several different venues within Perth City. 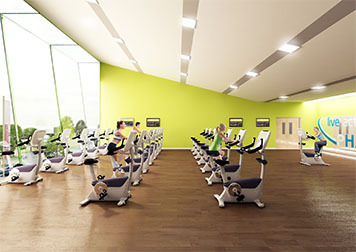 Bringing these together under one roof, improves the experience and opportunities for the customer eg mum can go to the gym, dad can go for a swim, while kids have their skating lesson. This will drive up revenue and the numbers of people benefiting from a more active lifestyle, but will also reduce operating costs as duplication in support infrastructure is addressed. Perth Leisure Pool opened in 1988 and was closely followed, 2 years later by Dewars Centre. The infrastructure is ageing and is becoming increasingly costly to maintain and operate. Both buildings consume a lot of energy, one in the preparation of ice which generates heat and the other, in heating water to a suitable temperature for bathers. The plant rooms are currently at opposite corners of the site, too far apart to be linked. In PH2O the plant rooms can be combined allowing the incorporation of heat exchangers to reuse waste heat from the ice plant to pre-heat water for the swimming pool. There may be further opportunities to use the heat generated on site for neighbouring developments. Rationalisation of venues and the delivery of PH2O improves the quality of the product and enhances the financial sustainability of provision, including an estimated 20% saving on energy costs. "This project is aspirational but it is also deliverable; a £25 million investment in PH2O offers a unique ‘spend to save’ opportunity. The present delivery model, over multiple sites which are beginning to show their age is simply not sustainable. "